A fine quality 1-1/4" diameter sterling and silver gilt pin by Solje of Norway. 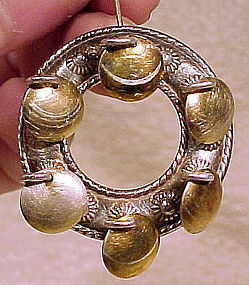 This pin has a c-clasp and dangling gilt silver discs. It is stamped 830S with a cypher maker's mark and it weighs 5.0 grams. It is in excellent condition with no dents, bends, corrosion, losses, damage or repairs. All items are thoroughly and conservatively graded and all condition issues are noted; all items are vintage or antique and may have slight signs of gentle use. Tracked Packet shipping to the U.S. is $17 - this includes online tracking, air service and insurance. Items paid with a credit card will be shipped to confirmed addresses only. We do ship internationally. All of our prices are in $US. PLEASE NOTE: we DO NOT accept PayPal, only VISA and MASTERCARD. 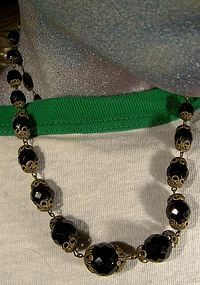 A vintage Art Deco Czechoslovakian French Jet (black glass) and brass filigree necklace c1920s. This 17-3/8" necklace is graduated and it measures from 1/4" to 1/2" across the faceted glass beads, which each have brass caps and loops. It has a springring clasp and it is marked CZECHOSLOV on the loop. This necklace is in excellent condition with no chips, cracks, dents, bends, corrosion, losses, damage or repairs. There are some traces of verdigris (green residue) from makeup which can be readily removed. All items are thoroughly and conservatively graded and all condition issues are noted; all items are vintage or antique and may have slight signs of gentle use. Tracked Packet shipping to the U.S. is $17 - this includes online tracking, air service and insurance. Items paid with a credit card will be shipped to confirmed addresses only. We do ship internationally. All of our prices are in $US. PLEASE NOTE: we DO NOT accept PayPal, only VISA and MASTERCARD. 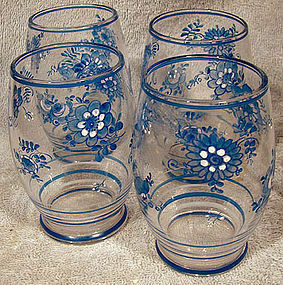 A set of four Czech hand painted enamelled blue flower glasses or tumblers circa 1920. These vintage 3-3/4" tall unmarked decorative glasses are in excellent condition with no chips, cracks, losses, damage or repairs. All items are thoroughly and conservatively graded and all condition issues are noted; all items are vintage or antique and may have slight signs of gentle use. Tracked Packet shipping to the U.S. starts at $17 - this includes online tracking, air service and insurance for loss. Items paid with a credit card will be shipped to confirmed addresses only. We do ship internationally. All of our prices are in $US. PLEASE NOTE: we DO NOT accept PayPal, only VISA and MASTERCARD. 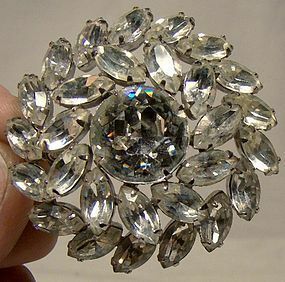 A 1-3/4" across round signed Sherman white rhinestone pin c1950s. This pin features claw-set foil-backed rhinestones and it has a safety clasp. This item is in excellent condition with no chips, cracks, dents, bends, corrosion, losses, damage or repairs other than some minor dulling to some of the stones. All items are thoroughly and conservatively graded and all condition issues are noted; all items are vintage or antique and may have slight signs of gentle use. Small packet air shipping to the U.S. starts at $8.95 (other spots may vary, tracked s higher). Items paid with a credit card will be shipped to confirmed addresses only. We do ship internationally. All of our prices are in $US. PLEASE NOTE: we DO NOT accept PayPal, only VISA and MASTERCARD. 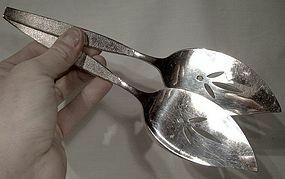 A pair of 4-1/4" sugar tongs in the sterling silver Bead pattern, issued by Birks, Canada. These tongs weigh 23.9 grams, and they are in excellent condition with no dents, bends, corrosion, losses, damage or repairs; they have a Gothic M monogram. All items are thoroughly and conservatively graded and all condition issues are noted; all items are vintage or antique and may have slight signs of gentle use. Small packet air shipping to the U.S. starts at $9.25 (other spots may vary). Items paid with a credit card will be shipped to confirmed addresses only. We do ship internationally. All of our prices are in $US. PLEASE NOTE: we DO NOT accept PayPal, only VISA and MASTERCARD. 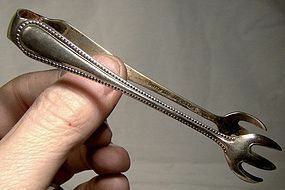 A Birks Saxon sterling silver baby spoon and fork set. 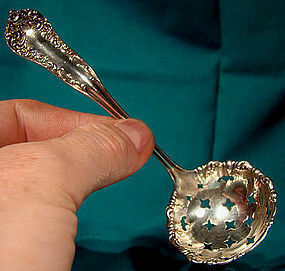 This vintage matching sterling silver baby set is in the sterling silver Saxon pattern by Birks, Canada. 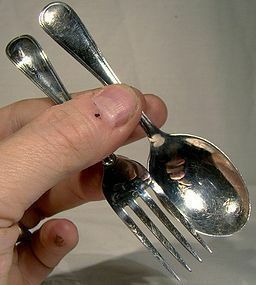 This 4-3/8" fork and spoon weigh a total of 36.9 grams, and this set is in excellent vintage condition with no dents, bends, monograms, corrosion, losses, damage or repairs other than some minor scrapes to the bowl of the spoon. All items are thoroughly and conservatively graded and all condition issues are noted; all items are vintage or antique and may have slight signs of gentle use. Tracked Packet shipping to anywhere in the U.S. is $14.00 - this includes online tracking, air service and insurance up to $70. Items paid with a credit card will be shipped to confirmed addresses only. We do ship internationally. All of our prices are in $US. PLEASE NOTE: We DO NOT accept PayPal. 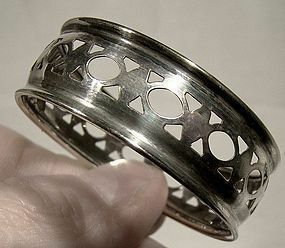 A vintage pierced sterling silver napkin ring c1920s by Roden. Roden was bought out by Birks in 1928. 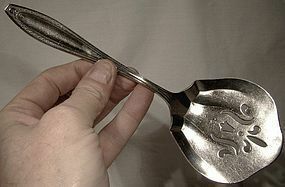 It is stamped STERLING with the Roden company mark. Birks bought all Roden's inventory and parts and molds, and the Roden mark can be seen on some Birks silver items until several decades after. This 1-3/4" across napkin ring is 5/8" wide, and it has (remarkably) never been monogrammed. 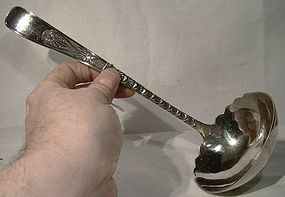 It has the Roden maker's mark and Sterling, it weighs 5.4 grams, and it is in mostly excellent condition with no dents, breaks, losses, damage or repairs, but it is a little out of round, and could stand a better polishing. All items are thoroughly and conservatively graded and all condition issues are noted; all items are vintage or antique and may have slight signs of gentle use. Small packet air shipping to the U.S. starts at $8.95 (other spots may vary) - insured is higher. Items paid with a credit card will be shipped to confirmed addresses only. We do ship internationally. All of our prices are in $US. PLEASE NOTE: WE DO NOT accept PayPal, only VISA and MASTERCARD. A sterling napkin ring fully hallmarked for Birmingham, England 1953. 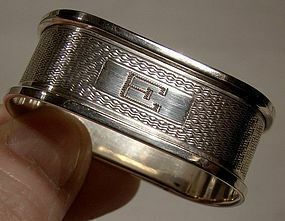 This 1-7/8" x 1-1/4" napkin ring is 3/4" wide, in the shape of an oval race track, and it has an E monogram. It has a B&CO. maker's mark for W.I. Broadway & Co., it weighs 10.7 grams, and it is in excellent vintage condition with no dents, bends, corrosion, losses, damage or repairs. All items are thoroughly and conservatively graded and all condition issues are noted; all items are vintage or antique and may have slight signs of gentle use. Tracked Packet shipping to anywhere in the U.S. is $14.00 - this includes online tracking, air service and insurance up to $70. Items paid with a credit card will be shipped to confirmed addresses only. We do ship internationally. All of our prices are in $US. PLEASE NOTE: We DO NOT accept PayPal. 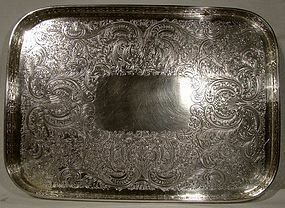 An ornate, finely decorated rectangular galley drinks tray c1910. This 11-1/8 x 8" tray has a pierced gallery and it is of heavy and solid construction (it weighs 640 grams). 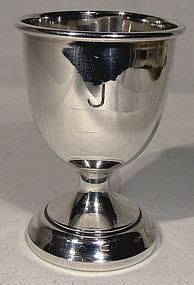 It is silver plated on copper and it has the maker's mark for Charles Howard Collins of Birmingham, England (founded c1895). This item is in excellent condition with no dents, bends, corrosion, losses, damage or repairs other than two small areas on the inside edge at the gallery showing copper (the largest is 1/4" long) and PNHS scratched near the mark on the back. All items are thoroughly and conservatively graded and all condition issues are noted; all items are vintage or antique and may have slight signs of gentle use. Expedited tracked and insured parcel shipping to the U.S. starts at $23 (other spots may vary, air is higher). Items paid with a credit card will be shipped to confirmed addresses only. We do ship internationally. All of our prices are in $US. PLEASE NOTE: we DO NOT accept PayPal, only VISA and MASTERCARD. 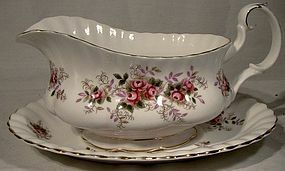 An 8" (from spout to handle) gravy boat and matching 8-1/2 x 5-7/8" fitted underplate in the Lavender Rose pattern by Royal Albert. This English bone china serving piece is in excellent condition with no chips, cracks, crazing, losses, damage or repairs other than some minor wear to the gold trim on both pieces. Please note that the mark and closeup are from other pieces and are for illustration only (the mark on the gravy omits the date). All items are thoroughly and conservatively graded and all condition issues are noted; all items are vintage or antique and may have slight signs of gentle use. Surface shipping to the U.S. starts at $14 (other spots may vary) - insurance is included. Items paid with a credit card will be shipped to confirmed addresses only. We do ship internationally. All of our prices are in $US. PLEASE NOTE: we DO NOT accept PayPal, only VISA and MASTERCARD. 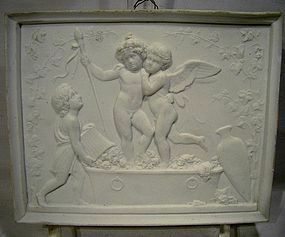 A 19thC Royal Copenhagen white bisque porcelain plaque with cherubs circa 1860 1880. This antique Danish 6" x 4-7/8" wall has a detailed scen of cheubic figures helping to gather and crush grapes. It is marked ENERET EB on the back with the three blue lines Copenhagen mark. This item is in very good condition with no crazing, losses, damage or repairs other than some original firing lines/cracks cracks on the top and bottom edges which are original to the manufacture of the piece and two small edge chips on the right hand edge. All condition issues are noted; all items are vintage or antique and may have signs of use and patina as would be expected. GUARANTEE: ALL of our items are antique or vintage and from the period listed. Expedited tracked parcel post to the U.S. starts at $21 and expedited tracked post within Canada starts at $15 (rates vary by distance). Rates vary by destination, value, size, weight, payment option, etc. Other payment, tracking and insurance options are available - please inquire. Items paid with a credit card will be sentd to confirmed addresses only. All of our prices are in $US. PLEASE NOTE: we DO NOT accept PayPal, only VISA and MASTERCARD. 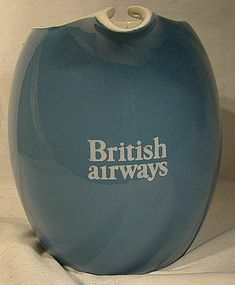 A 5-3/4" high blue and white glazed pottery water pitcher or jug from British Airways. Made and marked by Royal Norfolk, Staffordshire, England, this travel advertising item is in excellent condition with no chips, cracks, crazing, losses, damage or repairs. All items are thoroughly and conservatively graded and all condition issues are noted; all items are vintage or antique and may have slight signs of gentle use. Surface shipping to the U.S. starts at $14 (other spots may vary) - insurance is included. Items paid with a credit card will be shipped to confirmed addresses only. We do ship internationally. All of our prices are in $US. PLEASE NOTE: we DO NOT accept PayPal, only VISA and MASTERCARD.